“Golden-shielded, silver-sworded, man-loving, male-child slaughtering Amazons,” is how the fifth-century Greek historian Hellanicus described the Amazons, and they have fascinated humanity ever since. Did they really exist? For centuries, scholars consigned them to the world of myth, but Lyn Webster Wilde journeyed into the homeland of the Amazons and uncovered astonishing evidence of their historic reality. North of the Black Sea she found archaeological excavations of graves of Iron Age women buried with arrows, swords and armor. In the hidden world of the Hittites, near the Amazons’ ancient capital of Thermiscyra in Anatolia, she unearthed traces of powerful priestesses, women-only religious cults, and an armed, bisexual goddess—all possible sources for the ferocious women. Combining scholarly penetration with a sense of adventure, Webster Wilde has produced a coherent and absorbing book that challenges preconceived notions, still disturbingly widespread, of what men and women can do. Chapters include: Who Were the Amazons? ; The Secret of the Steppes; Artemis: Bright and Dark; The Medusa Face of the Goddess; The Hittite Sphinx; The Source; The Ghost Dancers; The Last Amazons; more. Published at $14.95, our price only $9.95. 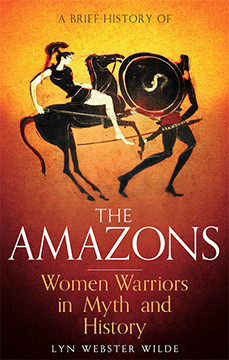 THE AMAZONS: Women Warriors in Myth and History By Lyn Webster Wilde. 256 Pages. 5x8 Paperback. Illustrated. Maps. Bibliography. Index.